Wife, Sowmya, and a friend of the latter employed themselves the next day mostly shopping (goodness knows what they shopped – I think my wife bought a shalwar chameez). I stayed home, mostly sipping warm lassy. The following day (Saturday) my wife was taken by Ravi (our taxi driver) to visit two temples and she took some photos. Next day – Sunday – we all went to the karyalaya, centre of activities of Sw. Subraya Sharma. A large group of students, both young and adult, were sitting around in the large room – as they do every Sunday – to study Advaita Vedanta under the direction of Subraya Sharma. They all speak Kannada (definitely better than they do English, at least to my ear), so no problem. 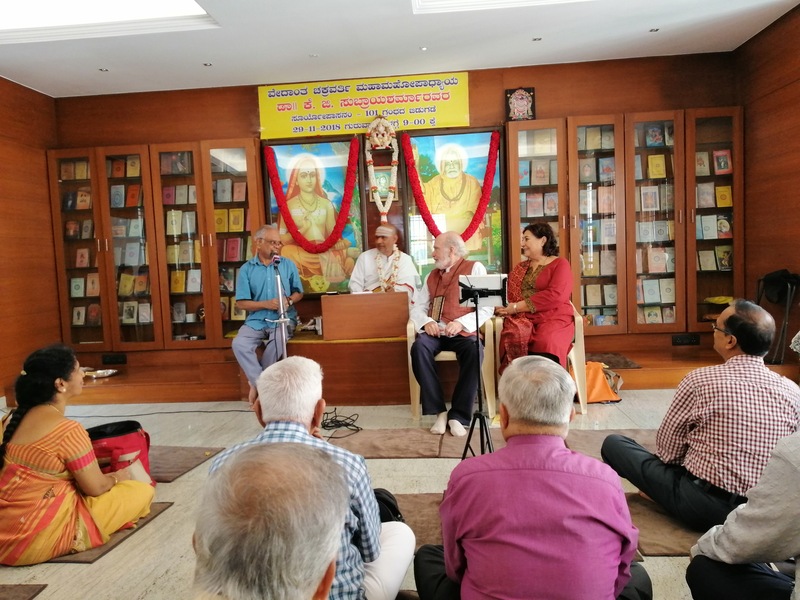 Since the group of people we met at that school was different from that of the previous occasion, I submitted myself to a brief introduction and explained the circumstances and motives that took me and my wife to Bangalore and also to the writings of Swamiji. There was general nodding by the crowd on hearing my words. Sw. Subraya Sharma asked me some questions and I elaborated as well as I could on the intricacies of adhyasa and the role it plays in Advaita Vedanta. Also, I spoke on the reason why I was attracted by Swamiji’s writings when I first encountered them. The meeting was quite congenial, without some of the tension that transpired at the previous location. At the end of the meeting an advanced adult student went to the micro standing at the front and expressed the possible puzzlement (one may feel) at the circumstance that “a white European had to come to India to remind us of our own great traditions”. This, to be taken with a grain or two of salt, of course. The ‘service apartment’ where we were lodging (Krishna Cedar Apartment) is located in the area of Basavanagudi of Bangalore. 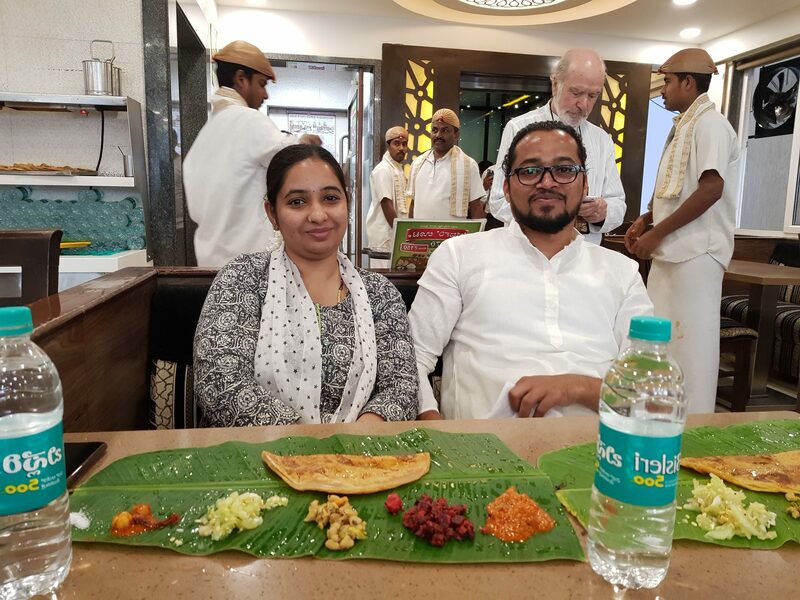 After the meeting at the karyalaya Sowmya and her young husband took us to a popular local restaurant – “Kamat Bugle Rock Cafe” – where we had some delicious “Roti Ghar”. My wife remarked that, surprisingly, the Indian food we used to eat at Indian restaurants in Toronto was more spicy than the one we just had, which is extensive to other restaurants in Bangalore (needless to say, we did not frequent many of them – just two or three during our short visit to India). 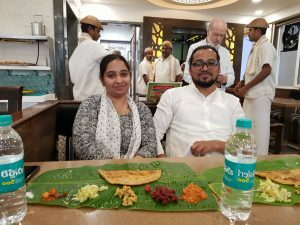 This entry was posted in Uncategorized and tagged Bangalore, india, Roti Ghar, Sw.Satchidanandendra, Sw.Subraya Sharma by amartingarcia. Bookmark the permalink.